Dan Absalonson | Author of SciFi & Fantasy: I'm Creating A Web Comic! So, I'm making a web comic. This is something I've wanted to do for many years, I just never had a good story for one. Last year I wrote a novella during NaNoWriMo, and I'm going to draw out that story as a comic. I will also be releasing the novella in all the eBook formats. It will be fun to come up with some way to sell them together too. It will kind of be like a graphic novel in the sense that it will be one long story. I have no idea how many pages it will end up being, but I'm excited to learn a ton in the process of making this comic. I am going to release it for free as a web comic and I'll also be printing it as a graphic novel once it's all done. I've been drawing the main character for a couple months now, trying to nail down his design. I'm getting close. I've even started drawing a few panels for this web comic to do some color tests. I had an awesome idea for the coloring the other day. I was helping my four year old son color in his coloring book, and I loved the way the crayons make such bright colors. 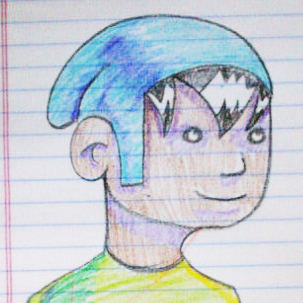 That night I did a quick drawing of my character rendered in crayon and I really liked the way it looked. It's kind of cool the way they have a certain texture too, where a bit of the white paper shows through. It reminded me of drawing when I was a kid and I wondered how I could get that fun look into my comic. I even thought about doing the coloring with crayons, but then I had the idea. I could take one crayon and color a whole piece of paper with it, then scan it into the computer. I could use that colored page to make whatever colors I wanted for my comic, and get that nice fun texture you get from crayons. I can just take the colored page, put my line drawing on top of it, and shift it to whatever colors I want digitally. For example I make a selection of the character's hat from the crayon colored page, erase everywhere else on the page so there is only color in his hat, and then shift that color to whatever I want. I'll upload the first test panel soon so you can see what I'm talking about. I tried it a little last night, and looks awesome! It looks just as if I used crayons to color the comic. I want the colors to be nice and bright and fun and with this technique they will be. With the rougher look of the crayon coloring, I thought I would also ink the comic in a different way than I have before. Instead of using a nice thick pen to get clean lines from one stroke, I'm using a black ball point pen and going over the lines a whole bunch of times to thicken them up. This gives it a fun rough look that I think will look great with the crayon coloring. I've put a few of the drawings up here so you can see them as they are on the page before I do digital clean up and coloring. 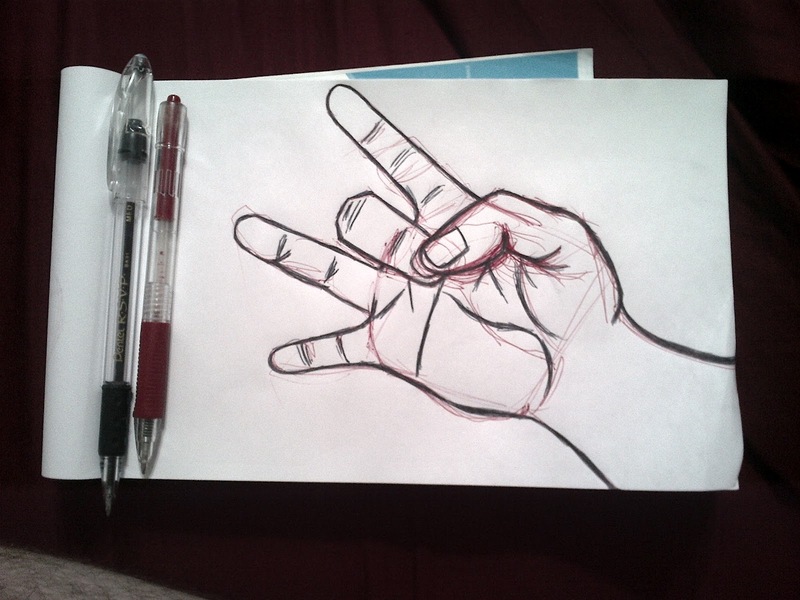 I used a red pen to sketch everything out then inked with a black pen. I erase the red lines in the computer and do the coloring. I'll have an example of that up here to share soon. Thanks for stopping by! I look forward to sharing stories with you in a new way with my art. Good luck Dan. I can't wait to see what you cook up. Thanks Mike! That makes two of us :) I appreciate the comment and thanks for stopping by my website.